(P1) For companies, behaving like an actual human being on social media is dangerous. Tightly control your company’s voice on Twitter and Facebook with endless rules, regulations, and procedures and the results might be ROBOTIC and ‘corporate,’ but at least you’ll avoid social media disasters. Allow your employees to express a little bit of a unique voice (or even humor), however, and you’re OPENING THE DOOR to potential MISSTEPS and the resulting embarrassment. (P2) Given these TRADE-OFFS, what’s the right path to walk for most small business owners? Should you play it safe and potentially come off as boring, or be human and risk all too human mistakes? (P3) A new study out of the Netherlands offers entrepreneurs PONDERING this DILEMMA some food for thought. The research focused on the social media profiles of the Dutch airline KLM, polling nearly 2,000 consumers in the country who had interacted with the company on social media about their level of contact with the brand and their perceptions of the ‘humanness’ of its voice. The researchers also asked for the consumers’ assessment of KLM’s reputation. (P4) The results probably shouldn’t surprise anyone who has spent any time being social online. The more ‘human’ a person thought KLM was being on social media, the more they interacted with the brand online and the better their perception of the company’s reputation. To put it simply, not speaking like a robot makes people more INCLINED to interact with your brand, and more likely to form a positive impression of it. (P5) “This study shows the importance for a company to communicate in a human-like way for establishing the best relationships with consumers,” researcher Corn Dijkmans said, SUMMING UP the findings. (P6) That might seem GLARINGLY obvious from the consumer’s perspective (who enjoys chatting with CARDBOARD corporate DRONES, after all?) but from the business owner’s side the terror of possible disasters — and the media SCORN HEAPED on these social media SCREWUPS — can COUNTERBALANCE the UNMISSABLE fact that nearly everyone prefers interacting with fellow humans. (P7) This study suggests you might want to get over that fear. If you’re going to go through the effort of being on social media at all, you certainly want to see a positive impact in your customers’ opinion of your company. If you HOLD THE REINS so tightly so that whoever handles your social media is afraid to express any SPARK of humanity, it might not be worth spending much time and effort on your accounts at all. 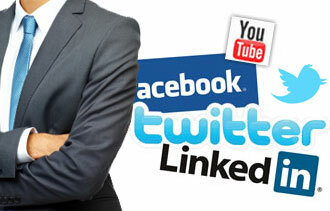 Is your company active on Facebook and Twitter? Do you think this is necessary for companies today? What is the worst “social media screwup” that you have heard about? Are you active on Facebook and Twitter yourself? How much? Have you ever made a comment or expressed an opinion online or in social media that was misunderstood?